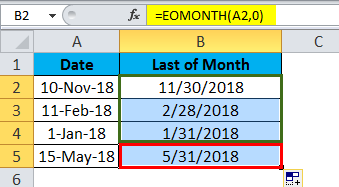 MONTH in Excel (Formula,Examples) | How to Use MONTH Function? 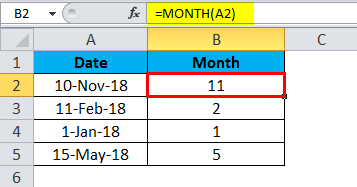 How to Use MONTH Function in Excel? 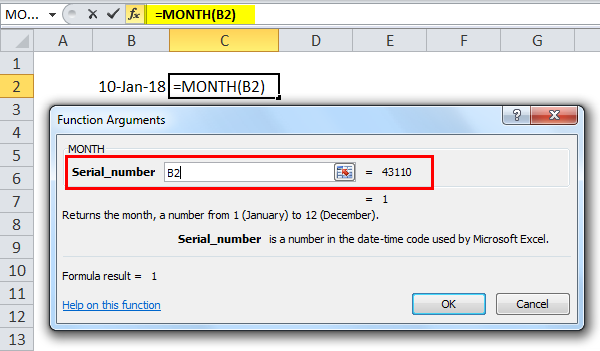 The Excel MONTH function returns an integer, representing the month (from 1 – 12) of a supplied date. 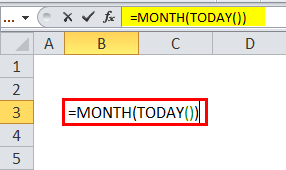 MONTH Function in Excel will come under the category of DATE/TIME functions. This function will return the month portion of a date as a number where the number would be between 1 to 12. In Accounting or Financial reports, we can use MONTH with DATE function to get an accurate result. There are three built in functions in Microsoft Excel – Day(), MONTH() & YEAR(). We will see all the examples one by one with clear explanation. Where the serial number argument is the date that you want to return the month. Serial numbers or Reference to cells containing dates or Date values returned from other Excel formulas. date_value/ Serial_number: A valid date to return the day. 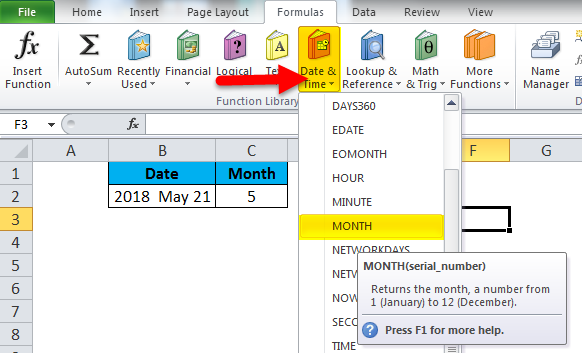 The DAY function returns a numeric value between 1 and 31.
date_value/Serial_number: A valid date to return the month. The YEAR function returns a numeric value between 1999 and 9999. MONTH Function in Excel can be used as part of a formula in a cell of a worksheet. Let’s consider the below example for good understanding. We cannot enter 10/05/2018 directly into the cell. Instead,d we need to enter “10/05/2018”. 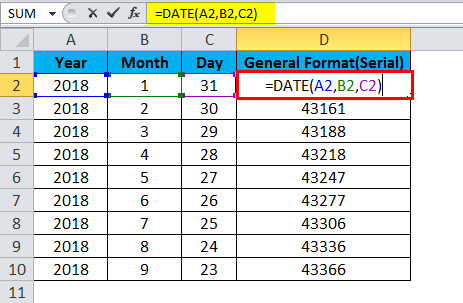 Excel will automatically convert dates stored in cells into serial format unless the date is entered in text. After entering into the cell how the formula input appears below the cell is shown below for reference. We will get a below dialogue box to select the specific cell where we have given Month Date Year. Give ok so that we will get the exact month value. 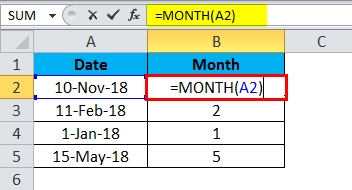 Using month function we can use choose & Today function to get the exact month name where in the above example we have used only MONTH function to get the month value. In the below example, we have used month function along with CHOOSE and TODAY. This dynamic formula will return the name of the month instead of month number. MONTH Function in excel is very simple easy to use. 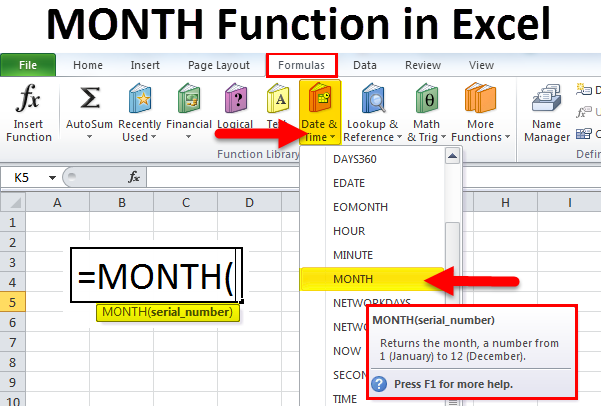 Let us now see how to use the MONTH Function in Excel with the help of some examples. Which will return the current today month. In the above example, we have retrieved the exact month by using the Month function to get the month name. We can see in certain scenario there will be Year, month, and a day will be given. In this case, we cannot use the MONTH function. To get the accurate result we can use Month Function along with the date function. where the year, month and day arguments are integers representing the year, month and day of the required date. 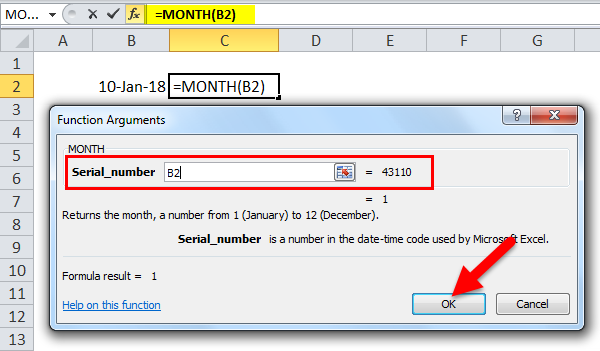 Now in the below example, we have used Month Function along with the date function to get the proper result. If we need to find out the end of the month EOMONTH can be useful to find out exactly. 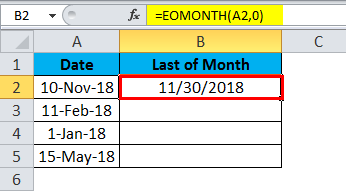 To calculate the last day of a month based on a given date, you can use the EOMONTH function. 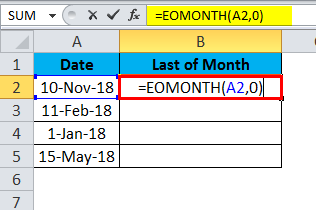 So in the above example, we can see A1 columns which have a day, Month & Year and B1 Columns shows the Last day of the month by using EOMONTH function. We can drag the formula by using Ctrl + D or double click on the right corner of the cell B2. In this way, we can easily extract the end of the month without using a calendar. This EOMONTH Function allows you to get the last day of the month in the future or past month. If we use Zero(o) for months, EOMONTH will return the last day of the month in the same month which we have seen in the above example. Alternatively, we can use Date, Year and Month function to return the last day of Month. So in the above example, we can see various month in A1 columns and B1 shows the Last day of the month. 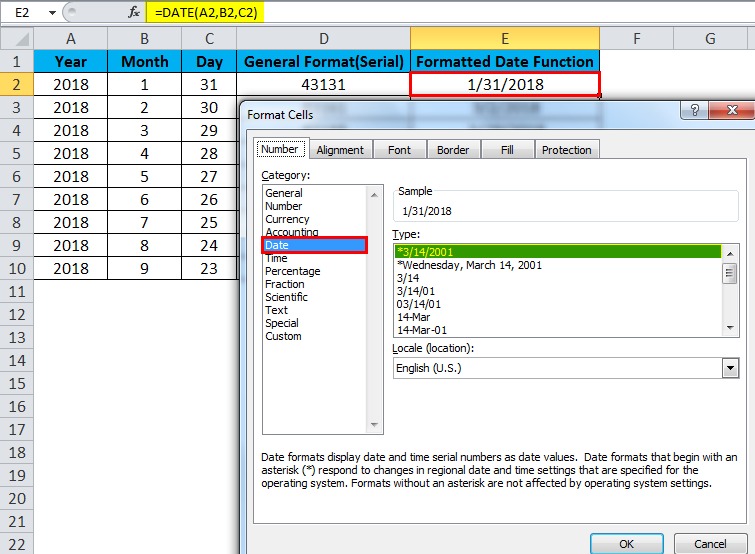 The excel date function is a built-in function in excel that will come under Date/Time Function where it returns the serial date value for a date. Year: A a number that is between 1 and 4 digits that represent the year. Month: This represents month value, if the month value is greater than 12 then every 12 months will add1 year to the year value. Day: This represents day Value. If the day value is greater than a number of days, then the exact number of months will be added to the month value. So in order to get the exact date to be displayed, we have to choose the format cells and then we need to choose the day, month & year format. In the above example, we have formatted the cell to get the appropriate date, month & year. 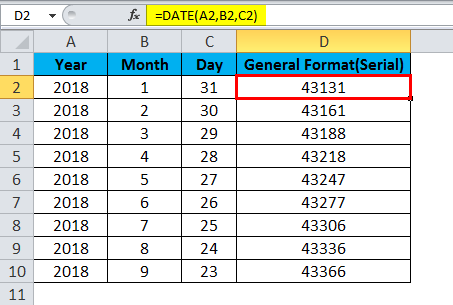 If we normally enter the date in the cell by default excel will take an integer value because of “General format”. So whenever we wish to update the date in the cell we need to format the cell and choose the appropriate date month and Year format. The Date from which you want to get the month number should be a valid date. If you mention an invalid date it will return #VALUE! error. if you skip entering any value in serial_number it will return. Guide To TRUE Function in Excel? How to Use OR Function in Excel? How to Use HLOOKUP Function in Excel? How to Use LEN Function in Excel? © 2019 - EDUCBA. ALL RIGHTS RESERVED. THE CERTIFICATION NAMES ARE THE TRADEMARKS OF THEIR RESPECTIVE OWNERS.